What MyMail does is that it brings every email you have into a single account, allowing you to access all of them from a single interface and save time. 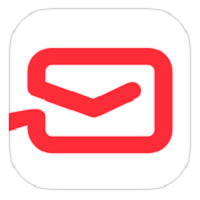 If you get a lot of emails then this app will really come in handy, especially since it supports IMAP and POP3. MyMail isn’t just easy to use, but it is also intuitive, and creating the free account is straight forward. What makes MyMail really convenient is it is was made expressly for mobile devices. With just a few swipes and taps you’ll be able to access your email, read, reply, forward and whatever tasks are required for email. Apart from the interface, MyMail also has many other useful features like push notifications that you can customize as well as get instant message notification even if your service doesn’t support this feature. You can turn these notifications off and add filters. The inbox is also easy to manage and you can browse through the messages via your friends’ avatars and icons. There’s also a robust search feature so you can sort through your email quickly. Finally, MyMail offers suggestions and phrases, handy for completing sentences and speed up your composition. With all these features, it’s nor surprising why this has become very popular for the iOS and Android.